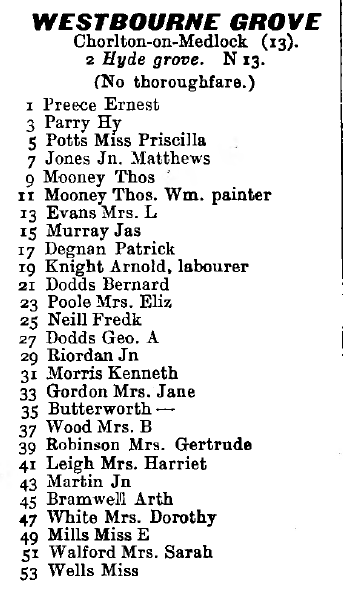 There is an entry in the Kelly's Directory 1963 of Westbourne grove, there were 26 properties, all odd numbered, think it was a cul de sac, no indication of where in C-O-M it was situated, will investigate further. Today I would guess it was close to Beckhampton Close. ps welcome to the forum. Hideaway 69 is spot on with the location of Westbourne Grove. I remember it well although it was fairly hidden away and was indeed a cul-de-sac. It was sandwiched between the backs of the large houses (including the dreaded clinic) on Shakespeare Street) and the backs of the houses on Hyde Grove. Westbourne ran parallel to both. Hyde Grove at its top end, turned 90 degrees left and crossed the top of Westbourne Grove and then onto Shakespeare Street. You could get into Westbourne from Plymouth Grove but only via a narrow passageway. The street at the Plymouth Grove end was also obscured fiuther, by large advertising hoardings that ran along Plymouth Grove around the corner and onto Shakespeare Street. We used to rollerskate on the wide pavement in front of the hordings as it was very smooth tarmac unlike the pavements in the rest of the area. Westbourne as I recollect, was only a narrow street, and was paved across its entire width with York stone paving. It was more of a wide-ish pavement than a defined road. The houses were on one side of the street only and faced the back gardens of the houses on Shakespeare Street. Each of the houses had a small front garden and each was bounded by a small picket style fence. It was one of those odd styled streets that you came across in unlikely places in the old Manchester areas. As a reference point, on the opposite corner of Shakespeare Street at the junction with Plymouth Grove is the Plymouth Grove Hotel. Although no longer a pub the building still stands, is grade 2 listed, has been renovated and is now a restaurant. I have checked the City Councils photo archive collection, and although I cant find a photo of Westbourne there is a photo towards the hoardings behind which Westbourne Grove stood This would have been taken from Plymouth Grove with the hotel on the left hand side. You can see the wide pavement where we used to rollerskate and the chimneys of Wesbourne/ Hyde Grove above and beyond the hoardings. If you need a map of the area that shows Westbourne Grove this can be found in the Manchester University Collection at the following link. The map is zoom-able and very clear. You will need to look for Shakespeare Street and Plymouth Grove towards the top left of the map. If it's of any use to you, I have attached 2 x extracts from Kelly's Directory that shows all the residents of Westbourne Grove, including Patrick Coyle at number 37. I'm sorry but I can't put a date on this edition of Kelly's as it's in a very fragile and frail state. The spine of the Directory and part of the front cover are missing, where the date would have been recorded. It could be any of the years between 1953 and 1963. Apologies that I can't be more precise. I was born at number 35 in 1956 and I remember Paddy and Nancy when I was growing up.